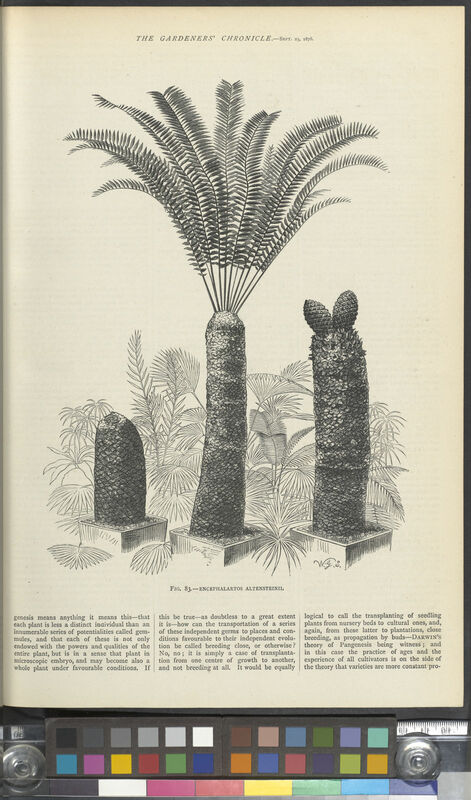 The name Encephalartos is derived from the Greek, and means 'bread in the head'. 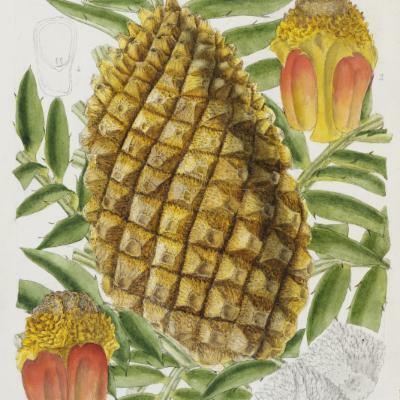 This refers to the practice of removing the pith from the cycad's stem and burying it in the ground for two months before kneading it into bread and baking it in embers. During the two-month burial, toxins within the pith are destroyed. The Eastern Cape giant cycad originates from South Africa, is long-lived and slow growing, and is popular as an ornamental plant. 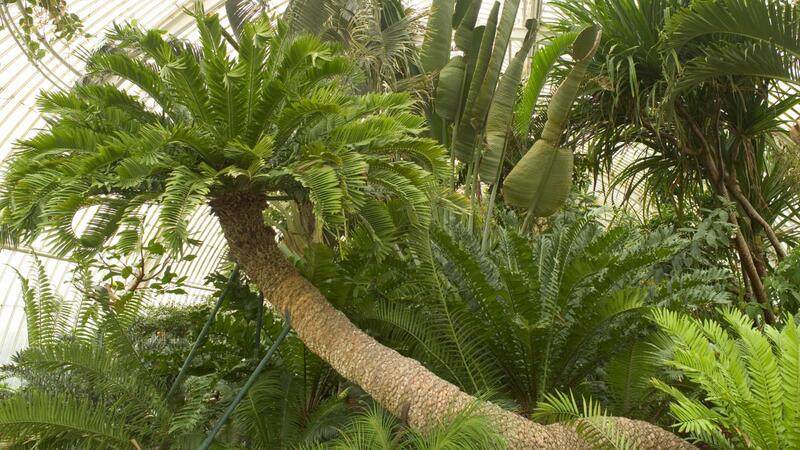 The superb specimen of this cycad at Kew is one of the oldest pot plants in the world. It was collected in the Eastern Cape province of South Africa in the early 1770s and brought back to England in 1775 by Francis Masson, one of Kew's earliest plant collectors. For many years the Kew plant was known as E. longifolius but recent studies in South Africa have proved that it is E. altensteinii. 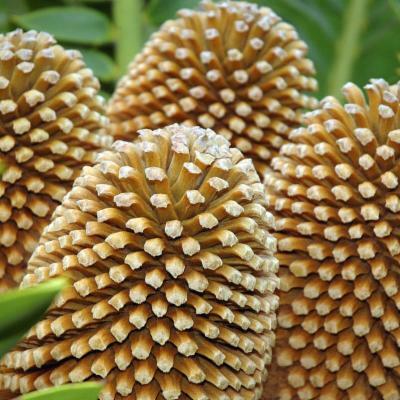 The cycad now measures 4 m 23 cm from the base of its stem to the growing point (an average growth rate of only 2.5 cm per year). It has produced a cone only once at Kew. On that occasion in 1819, Sir Joseph Banks came to view the plant on what proved to be his last visit to Kew. The Eastern Cape giant cycad is widely distributed in the Eastern Cape and south-western KwaZulu-Natal, South Africa. In the early years, this popular ornamental species appears trunkless, producing stiff, pinnate, palm-like leaves to 2.5m long with spiny bright green leaflets. Leaves are whorled forming a dense upright crown. Over time, a stout trunk begins to develop, eventually rising to 4-5m tall. Although woody in appearance, the stem mostly comprises soft, pithy storage tissue protected by a solid layer of old leaf-bases. Initially, the single stem is erect, but over time it usually begins to recline, and can produce suckers from the base, forming a clump of multiple stems. 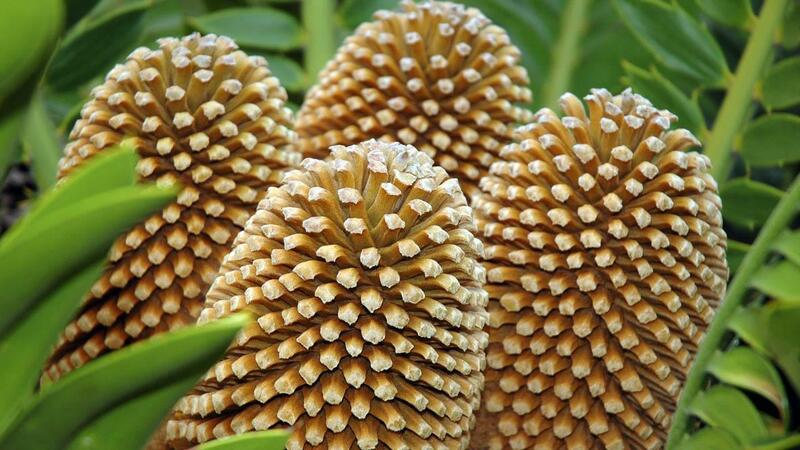 At reproductive maturity separate plants bear between two to five male or female cones on each stem. 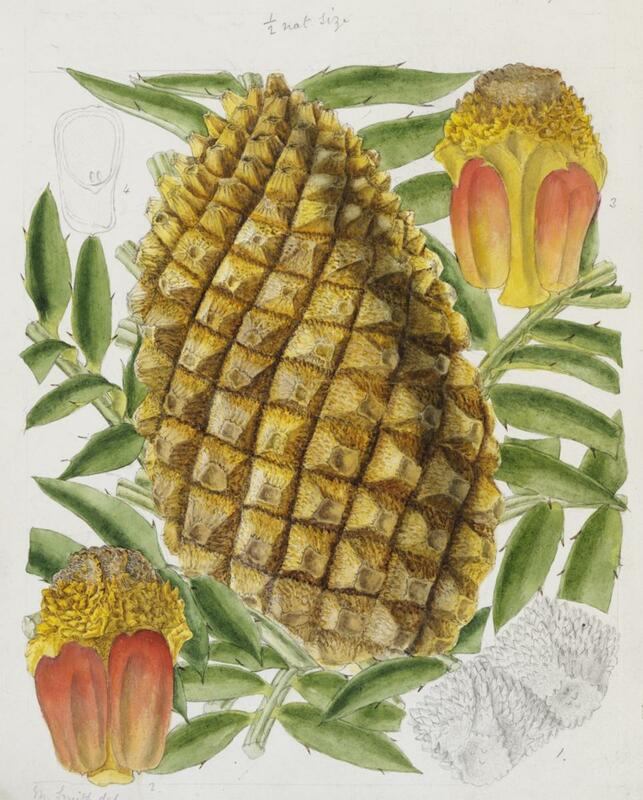 The large, yellowish green female cones are egg-shaped, almost resembling a pineapple, while the similarly coloured, but the smaller male cones are cylindrical. The seeds produced are large and have a red, fleshy outer coat, but are relatively short-lived and vulnerable to desiccation. The seeds are known to attract the Knysna turaco and trumpeter hornbill. Consuming the seeds, these birds digest the outer coat but then regurgitate the unpalatable part of the seed. If these are discarded in a hospitable environment, there is a relatively good chance they will germinate and grow into a mature plant. Our specimen of Encephalartos altensteinii was collected for the botanic garden in 1773 by Kew's first plant hunter, Francis Masson. 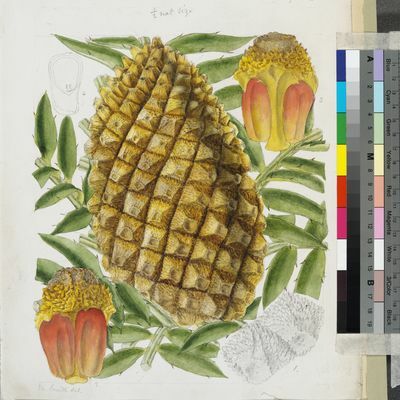 Sir Joseph Banks was the 'unofficial' head of Kew at the time, and had ambitions to build a world-class botanic collection on behalf of the King. 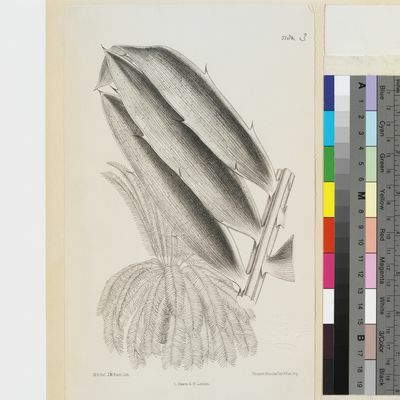 Banks sent Masson to South Africa to find new plants for King George III's collection, and Masson was very successful - he also introduced the first 'bird of paradise' plant ( Strelitzia reginae ), arum lilies, proteas and red-hot pokers. This plant would have been dug up in the South African forest, carried across country by a team of African porters, and loaded onto a wooden sailing ship at the Cape. It would then have sailed slowly back round the coast of West Africa to London, a journey of several months, with the plant strapped to the deck to allow it rainwater and sunlight. Once the plant reached the Port of London, it would have been loaded onto a barge and taken upstream along the Thames to Kew. It has been here at the Gardens ever since, and was already a pensioner when it was moved into the newly finished Palm House in 1848. Francis Masson died collecting plants in Canada in 1805, but his contribution to Kew continues to be remembered, particularly in association with this cycad. Although land clearance has claimed hundreds of Eastern Cape giant cycads, and numerous plants have been taken from the wild to sustain nurseries, this species remains common throughout its range. There are no specific conservation measures in place, but the species is listed on Appendix I of CITES, which permits trade only under exceptional circumstances. 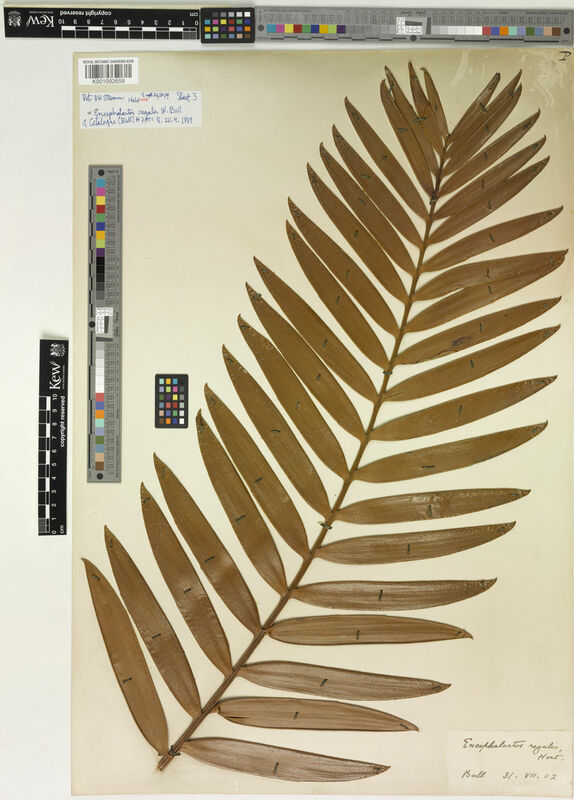 Encephalartos altensteinii is being monitored as part of the IUCN Sampled Red List Index for Plants , which aims to produce conservation assessments for a representative sample of the world's plant species. This information will then be used to monitor trends in extinction risk and help focus conservation efforts where they are needed most. The Eastern Cape giant cycad is grown as a pot plant and popular ornamental garden species. The stem pith is also used for food (sago) by removing it, burying it, rotting it, digging it up, kneading and baking it. Encephalartos altensteinii requires fertile well-drained soil and ample water. It can withstand relatively long dry spells but plants that receive regular water are healthier and have larger leaves. During summer give sufficient water to soak the root area once a week. Watering can be suspended during winter. Good drainage is crucial. In hot dry regions inland, the sun tends to burn the leaves and they are better planted in light shade. A mulch of well-rotted compost applied at least once a year around the base of the plant, plus application of a balanced fertiliser twice a year during summer will keep the plant in good condition and maintain growth. 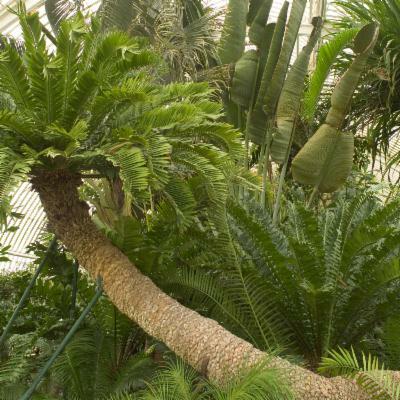 The south end of the Palm House at Kew houses a large specimen of Encephalartos altensteinii , which has been described as 'possibly the oldest pot plant in the world'. Found near the coast in habitat ranging from open shrubland on steep rocky slopes to closed evergreen forest in valleys. Rated as Vulnerable (VU) A2acd according to IUCN Red List criteria and listed on Appendix I of CITES. Encephalartos altensteinii is rated as Vulnerable (VU) according to IUCN Red List criteria and has received a EDGE score of -0.92, which places it in position 404 on the EDGE Gymnosperm list. It has a Evolutionary Distinctiveness of 7.94, ranked 271. 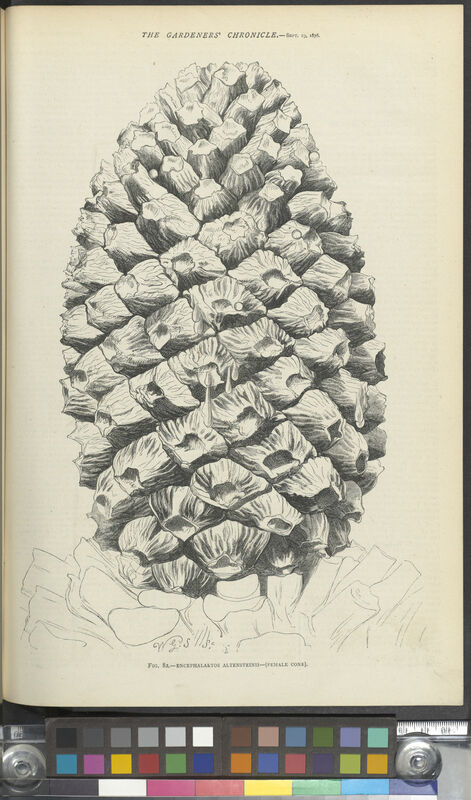 More information on the EDGE Gymnosperm project here https://www.edgeofexistence.org. Zamia katzeri Regel ex J.Schust. Donaldson, J. S. (2009). Encephalartos altensteinii. In: IUCN 2010. IUCN Red List of Threatened Species. Version 2010.3. < www.iucnredlist.org>. Downloaded on 21 September 2010. Jolivet, P. (2005). Cycads and beetles: recent views on pollination. The Cycad Newsletter, 28: 3-7. Whitelock, L. M. (2002). The Cycads. Timber Press, Portland, Oregon. Donaldson, J. S. (1997). Is there a floral parasite mutualism in cycad pollination? 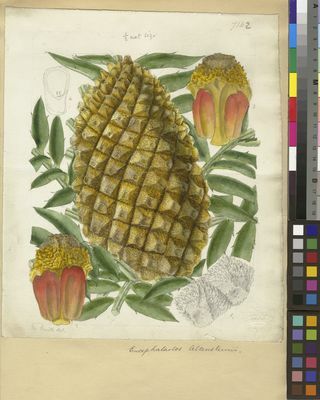 The pollination biology of Encephalartos villosus (Zamiaceae). 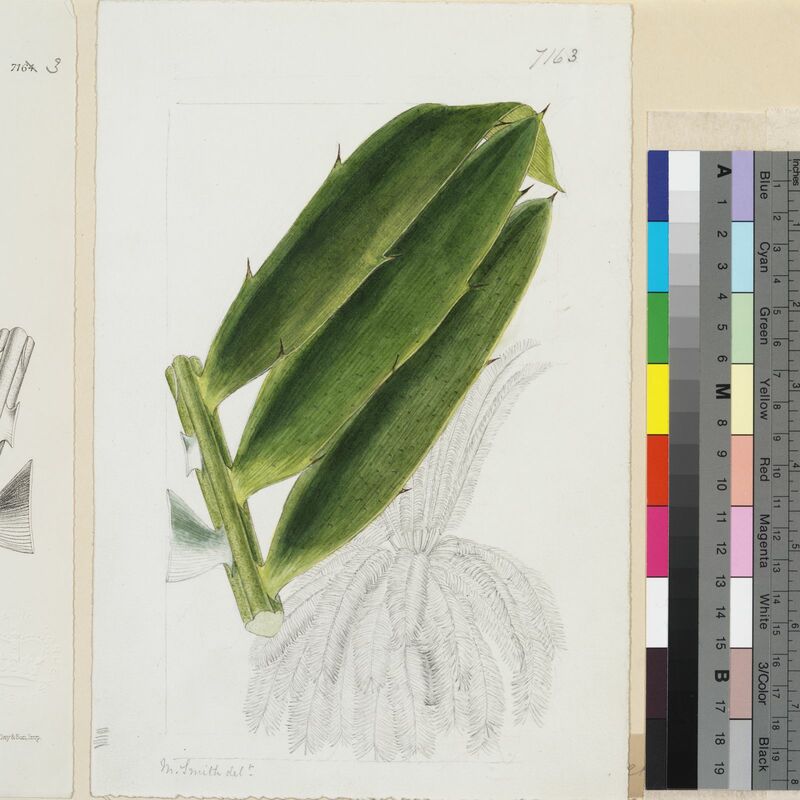 American Journal of Botany, 84: 1398–1406. 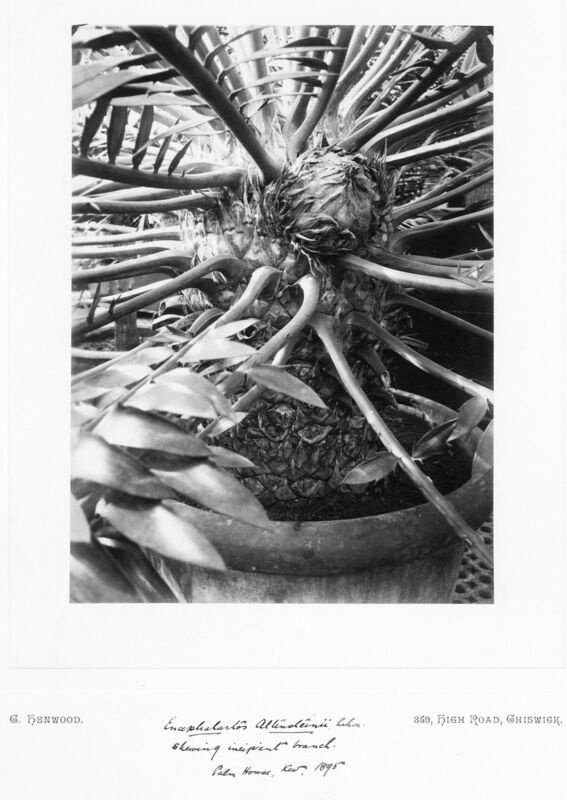 The Cycad Pages (November, 2008).